According to the Lion Alert website, every sounds a lion makes means something totally different. While one roar could tell nearby people or animals that they’re coming too close, slightly different grunt could mean that they’re signaling other members of its pride. The most common type of communication for a lion is the roar that wards off other prides that are coming too close to their home. This tiny lion could be roaring for a variety of reasons – maybe it’s hungry, missing Mom, is trying to locate other family members or just doesn’t want that big shiny camera to come any closer! Even though most roars are meant to warn others and locate pride members, some lion sounds are playful! In fact, lions make a wide range of noises that signal happiness! After a long time being separated, lions generally purr and growl to show their love and affection! While it’s impossible to tell exactly what this little lion is thinking, it’s pretty obvious that it has a lot to say! 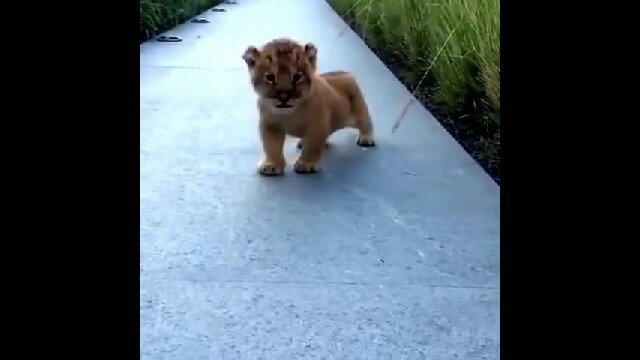 Take a peek at its adorable little roar by pressing “play” on the video below!